The little Hegel is all of us is tempted to dismiss pop art. It may no longer be revolutionary to appropriate commercial imagery and style into visual art, but Volta’s booths proved it still has some mileage left. Now in its true late style, we are well aware of the strengths and -- perhaps more importantly -- the limits of Pop. Indeed, the willingness to explore and harness its weakness is precisely what sweetens these late chapters. That content, light and fluffy as cotton candy, and with half the substance, can surely backfire into the meaninglessness of elevator music or small talk. But this idea of backfire is now the point. 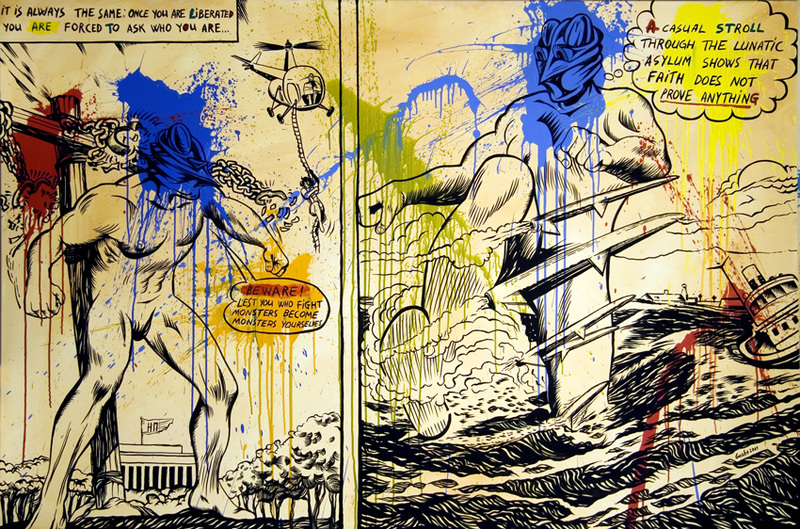 A Pop style can visually indict its subject as a pleasant lie or polite fiction that conceals an inconvenient truth. 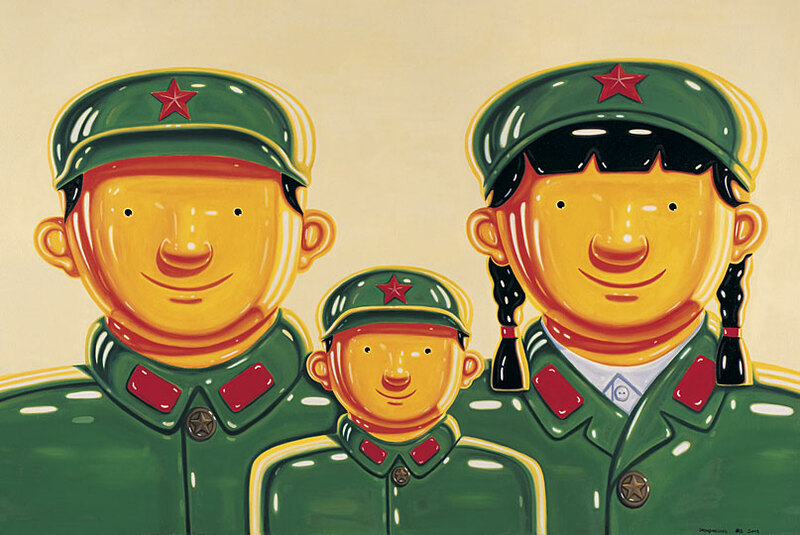 The paintings of Shen Jingdong at the stand of New York’s China Square gallery attack the fiction of the content army and the happy family. Casting these social ideals as smiling children’s toys reminds us that it’s a juvenile over-simplification to think in such saccharin terms: bringing up teenagers is practically masochistic for any parent and memories of combat haunt even the toughest veterans. As sparkles of light dance on new plastic, Shen Jingdon proves that not all that glitters is gold. The Eugenio Merino display of Barcelona’s Adn Galeria targets the dark lies of America instead of China. 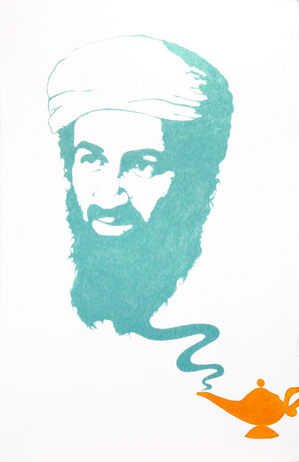 In one simple painting, Osama Bin Laden rises as a blue genie from his lamp - like a vintage Aladdin poster. The implication is that this radical granted Cheney’s wishes to alarm, exploit, and profit from fear; so beneficial was his presence to the military industrial complex. This happy levity of pop accurately captures how he enables the good times to roll for the connected elite. Gosha Ostretsov’s painting The Pain of Liberation from London’s Paradise Now gallery similarly questions perceptions of good and evil. He works in the broad style of the comic book in which hero and villain are crystal clear. Humans battle against a Godzilla-like creatures. But he does not paint inside his crisp lines and splatters bright splotches colors across the picture plane. It formally declares that this is a messy and sloppy view. Quotes in the bubbles from Nietzsche problementize this framework of good guy vs. bad guy. As humans assail an over sized beast with a bird like head, we read the potent aphorisms: It’s all the same: once you are liberated, you are forced to ask who you are…. Beware lest you who fight monsters become monsters yourselves. This art pushes our happy buttons against our will. Casting Osama Bin Laden in an unusually warm light forces the question of who might secretly wish he is never caught. Going overboard on the saccharin toy image of happy families asks viewers if they really want to buy into this alluring but damaging fantasy. One smiles like a little boy at the clash between brave fighters and untamed beast only to ponder quotes that deconstruct promises of liberation and our ability to provincialize our barbarism merely to those who "deserve" it. Only pop could so playfully show that images can look good for all the wrong reasons.